Bear meat is very useful for weak people with reduced immunity, who suffered a long illness and those who suffer from cardiovascular diseases, digestive disorders and other, difficult to treat, ailments. Bear meat has a peculiar taste, which depends on what the animal ate and how much meat is fatty. Because the fat gives the bear an unpleasant odor. But, if the meat is pre-processed correctly, you get a very tasty meal. For example, braised bear meat with mushrooms. To cook braised bear meat, you must first remove the peculiar smell. To do this, wash the meat under cold water, lightly dried with a cloth, and then RUB with cumin, garlic, pour the dry grass mint and crushed juniper berries. And then kept in a cool place during the day. Thus prepared meat is rinsed to remove residue of herbs, salt, grate black pepper and put to obzhivatjsya on the pan in a little vegetable oil. During this time, peel the carrots, turnip, bulb onion and parsley root. Chop the carrots and parsley roots into strips, turnip – diced, onion – rings. Mushrooms wash, cut into slices legs, and hats - small pieces. 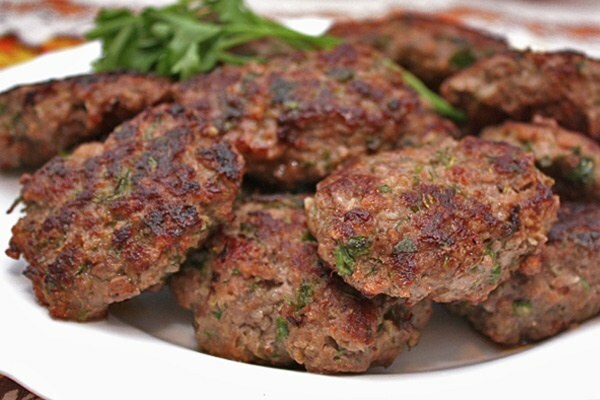 When frying the meat will appear a light crust, put it in a saucepan, pour bread kvass, add the vegetables, mushrooms and put to stew. After some time to check the contents of the saucepan for salt and add as needed. When the meat is soft, spread it on a plate, and in the remaining broth put the cranberries in advance passerovannoy flour, pour a bit of sugar and boiled for half an hour. The finished sauce pour stewed bear meat and bring to boil. Put in the plate portions, sprinkle with chopped parsley, dill and serve. Important! Bear meat must undergo sanitary control, as it is often infected with Trichinella. In order for meat to bear meat had lost the odor, you can soak it in a marinade, for example, in wine, with the addition of herbs and spices. Before cooking meat, preferably cut out layers of fat, in this case, the smell will be less. It is better to take the young bear, as old individuals have tough meat with a persistent unpleasant odor, difficult cooking. "Often Madat" means "bear paw"is the name of one of the most popular dishes of the Mordovian cuisine. This meat cakes with breadcrumbs, which looks really resemble the paws of a bear. They baked in the oven and served to the table hot. Surprise your loved ones this original and hearty, especially its preparation will not take much time. Rinse liver, pork and beef. Peel them from the foil, remove the veins and mince. 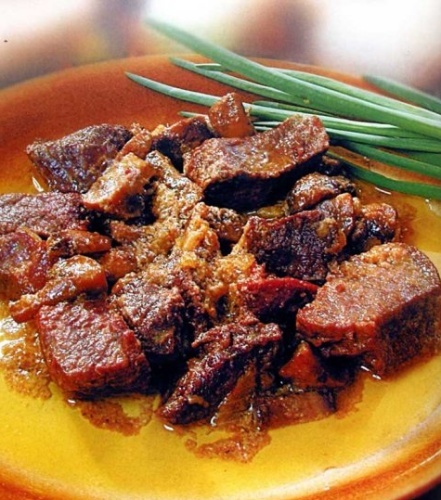 Pork liver should be soaked in cold water or milk for an hour. From this it will be much softer. To pellet turned out juicy, prefer chilled and not frozen meat. Chop the onion in small cubes. Heat the oil in a pan and fry in it onions. Slightly brown it and add to the meat mass. Pour the egg into the mince, squeeze through the press garlic teeth, salt and add spices to taste. Mix everything carefully. For spice you can add chopped parsley. If the mince is quite liquid, you can pour a couple of tablespoons of flour, then stir again and leave to rest for 20 minutes. Prepare the bread strips. It is better to use a slightly dried up loaf. To do this, cut the fresh loaf into slices and then into small wedges. Place them in a preheated to 180 degrees oven for three minutes. They will play the role of a claw. The baton can be easily replaced by rye bread, is a matter of taste. Form of minced tortillas. They should resemble the paws of a bear. Put the top bread "claws". As a rule, one "paw" requires no more than 3-4 wedges. In a bowl break the egg. Roll it "bear paws", and then place them on a baking sheet. Preheat the oven to 200 degrees and cook her tortillas until tender. It usually requires at least 30 minutes. Not bake this dish for a long time, there is a risk to overdry it. A sign of readiness can serve as arising from the pellets when you push the plug clear juice. Serve the finished "bear paws" hot. A suitable garnish for this and Mordovian dish will be mashed potatoes and a vegetable salad. However, it can serve as a standalone dish. Cakes can be pre-fry both sides and then bake in the oven.